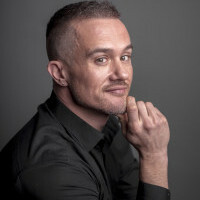 Richard Franke is founder and director of Magic Notion, developers of 'Kitty Powers' Matchmaker' the YouTube sensation arcade dating simulator and its sequel ‘Kitty Powers’ Love Life’. Richard worked in the games industry for over 20 years on award-winning titles such as The Burnout franchise, Need for Speed Hot Pursuit, and Tearaway before creating independent studio Magic Notion. He stars as his drag alter-ego Kitty Powers in Magic Notion's first two titles, as well as its upcoming, follow up 'Kitty Powers' Speed Date' as well as doing live appearances at events around the world. Kitty Powers spreads a message of love, acceptance, diversity and gender fluidity. This discussion will be led by game designer Richard Franke better known as Miss Kitty Powers. Richard’s 20 years as a designer along with his unique personal experience in the industry put him in the perfect position to chair this conversation. Come share your “T” with Richard and other industry professionals about the ups and downs of our industry and how we can all work together to improve it.